Edgecombe County native Richard T. Fountain was born near Leggett in 1885 at Cedar Lane as one of eleven children of Almon Leonida Fountain and Sarah Eagles Fountain. He attended the Tarboro Male Academy and then attended UNC where he received his law degree in 1907. After passing the bar, he practiced law in Rocky Mount and partnered with his cousin G.M.T. Fountain of Tarboro for the next fifteen years. After the death of his cousin, he entered a new partnership with his brother Benjamin Eagles Fountain. In his early legal career, he was appointed a judge of the first Municipal Court established in Rocky Mount in 1911. 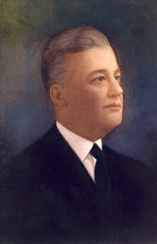 He soon became an advocate for the community, and in 1918 was elected to the first of five terms with the North Carolina House of Representatives, becoming speaker in 1927. He authored a bill in 1923 that established the Eastern Carolina Training School for Boys in Rocky Mount. This was a facility for juveniles for the purpose of schooling, vocational training, and rehabilitation and as a foster home for young males in the region. In 1969 the institution was later named the Richard T. Fountain School and is now known as Fountain Correctional Center for Women. His interest in education earned him a seat on the Rocky Mount School Board for 18 years, with seven of those as chairman. He also served on the Board of Trustees of the University of North Carolina. His service to the community was as director of the First National Bank, the New Home Builders and Loan Association, and the City Industrial Bank. Fountain was a charter member of the Rocky Mount Civitan Club and served as its President in 1927. He was also a member and President of the Rocky Mount Bar Association and Vice-President of the North Carolina Bar Association. From 1934-1942 he published the Rocky Mount Herald, a weekly newspaper, and wrote many editorials on community issues. Fountain was elected Lt. Governor of North Carolina in 1928 and served until 1932. He ran a strong race for the governorship in 1932 that resulted in a run-off election which he lost by 13,000 votes of the over 351,000 votes cast.